You’ve never heard of Wegmans, you say? All those unfortunates who have never visited this mecca of all that is good and generic should be aware that Wegmans is the best grocery store that ever was. It is a Disneyland for adults. But it's open 24 hours. Wegmans is known for having phenomenal generic brands and organic food, and catering to people with food allergies. Real food allergies, not like when I tell people I'm allergic to onions just because they're vile and I wouldn't touch them with a ten-foot pole. The first Wegmans store opened in Rochester, New York, and stores are now scattered throughout New York, New Jersey, Pennsylvania, Maryland, and Virginia. It’s often listed close to the tippy top of of Fortune magazine's "Top 100 Companies to Work For." Since Wegmans has an amazing employee college scholarship program, my father coached me from a very young age to say, "When I get older, I'm going to work at Wegmans." That was about the same time he and my mother tried to get my brother and me to sing "So Long, Farewell" for guests before we went to bed. Wegmans had always been a fun place to go with Mom, since the Wegmans Cookie Club guaranteed us kids a free giant cookie with every visit, but it became less fun when a visit to the store meant that my teenage hands would be covered in money germs and fish juice. I was excited to be a cashier at first—after all, I was making $4.35 an hour! That was a whole dime above minimum wage! And I could make excellent use of my work hours. I purposely took early weekend shifts so I had time to write my lines for our high school production of Fiddler on the Roof—for which the one Jewish family in school had to teach us about the Sabbath—over and over on the register tape until I memorized them. I liked putting on my costume and going to the store at first...but learning that cranberry juice cocktail was not WIC-approved and waiting while customers wrote personal checks—yes, checks—turned out to be less interesting than rereading Gone With the Wind for the 14th time. Which is what I would have been doing otherwise. As a picky eater, I couldn't tell a nectarine from a zucchini, let alone memorize the three-digit code that accompanied each fruit and vegetable in the entire store. I would have to stop the line, ashamedly ask the customer the name of the mystery fruit or vegetable, and look up the name on a giant chart printed in teeny tiny type. This greatly slowed down my line and caused irate customers to want to hit me with whatever fruit or vegetable was causing the problem. Clothed in my mom's old polyester dress pants, a tuxedo shirt, a clip-on bow tie, and a maroon apron, I was fairly irate myself. Mostly about the meat blood and chicken juice that always seemed to leak on me. And the prepared food/raw fish/recycled air smell that filled the store and clung to my clothes and hair. Plus, the fact that I got in two car accidents on two successive days on the way to work—I rear-ended someone at an intersection and then got rear-ended by the dog of a family I babysat for—didn't make me want to jump into one of our family's matching Taurus station wagons and drive the two miles to the wonderful land of Wegmans. After years of front end torture, Wegmans moved me to its one-hour photo lab, which meant I got to spy on birthday parties and baby showers. But never bar mitzvahs (see the above Fiddler on the Roof note). Suddenly, my job became marginally interesting. But not interesting enough. Since it was the pre-email era, I spent my downtime writing letters to friends on the back of the cherry red photo lab notices that were printed with the following statement: "Wegmans is a family company; therefore, we cannot develop your dirty pictures, moron. Next time, use a Polaroid." I might be paraphrasing. I was thrilled—thrilled, I tell you!—when I got a job as a day camp counselor at a city park. I traded fish juice and recycled air for water dodgeball* and sunshine! It took a few years for me to go into the store without shuddering. But since moving to Manhattan, I've realized that I took the amazingness of Wegmans for granted. On my first Saturday in the city, I got up early and steeled myself for the crowds I would be sure to encounter at the local Food Emporium. As I crossed the street to go into the store, I didn't see a soul. There were no moving vehicles. A tumbleweed or two blew across the street. The store was empty, there were few generic brands on the shelves, and a box of Funfetti cake mix cost $3.19. In short, Manhattan grocery shopping is the absolute worst. I still haven't recovered from a Wegmans-less existence. Every time I order Fresh Direct online or go to a so-called supermarket, I know what I'm missing. I'm missing WPop (first made famous by its product launch commercial with happy pop-drinkers shouting, "Woooo!"). I'm missing the most mouth-watering, freshly-prepared garlic and herb cheese spread that ever was. I'm missing a giant bulk candy section with a toy train running above it. I'm missing the feeling of walking into a supermarket and wanting to twirl and twirl and twirl, just like Fraulein Maria on the hillside. The Food Emporium is not, I'm sad to say, alive with the sound of music. In fact, the Food Emporium is alive with…well, I don’t even want to tell you what it’s alive with. I never did get that Wegmans college scholarship. You had to put in way more hours than I was willing to, and you had to return from college every so often to work at the store. That did not, however, stop me from telling my sorority that I did, in fact, have a Wegmans scholarship and needed to be excused from pledging activities for an entire weekend so that I could go home to "work." So in the end, Wegmans gave me a gift after all—I slept for 48 hours and ate home-cooked food without being at the beck and call of 50 irate upperclassmen. Sometimes, I guess getting a little meat blood on your hands isn't such a bad thing. *If you’re curious, water dodgeball is regular dodgeball with one of two modifications: You can either soak the Nerf ball in a bucket of water before throwing it or wring a wet rag over the head of a child as punishment for being hit by a regular ball. Note: Getting hit by a soaking wet dodgeball can really hurt. Today, I am a Magician's Assistant. Having not seen any type of magic show since SUNY Geneseo hired a hypnotist to entertain my half-petrified/half-drunk freshman class on the first day of college, I wasn't quite sure what to expect when I showed up at the Waldorf Towers and announced to Ionna, the beautifully-accented front desk attendant, that I would be Steve Cohen's assistant for the weekend. I was immediately given a key card so I could instruct the elevator to take me to the much-coveted 35th floor. I had actually been in the Waldorf previously—I sold Broadway tickets at extremely inflated prices for a ticket broker company that masquerades as a helpful concierge service, but that's a whole other story. When I gingerly stepped out of the elevator and onto the plush carpeting of the 35th floor, I decided to "accidentally" walk down the wrong hallway to get the lay of the land, and I suddenly found myself eyeballing the Presidential Suite. Now, I assumed that "Presidential" was only used as a synonym for "Fancy and Expensive," but it seems that I just my country mouse way of thinking. The Presidential Suite has been occupied by every President since Herbert Hoover. Seriously. I later found a plaque in Steve's suite noting it to be the suite in which LBJ received Pope Paul IV. My very Catholic parents were blown away by that one. Seemingly mirroring my anticipation, the doorbell to Steve's suite went "ding" but not "dong." Steve showed me around the suite, and though I couldn't have imagined it beforehand, I found upon seeing it that it was exactly as I would have imagined—beautiful classic (huge!) rooms with ornate formal draperies, chandeliers, old-fashioned furniture, and original fixtures. I promptly fell in love with the bathroom, with its tan and black checkered floor, which seemed to be transported there from Daddy Warbucks' mansion. In retrospect, I realize that I should have been slightly nervous about going to a suite belonging to a unfamiliar man with a penchant for making things disappear, but I seemed to be full of small town trust at that particular moment. And I had nothing to worry about. I knew that having a show at the Waldorf qualified Steve as being a top-notch magician, and I had seen his website (www.ChamberMagic.com) with images of him being interviewed by David Letterman. When I saw a framed article featuring him in the Forbes "400 Richest People in the World" 2005 edition, however, my palms started to sweat. Was I klassy (yes, klassy) enough to assist "The Millionaires' Magician"? Steve turned out to be a very thorough, lovely, and particular (in the best sense) boss. He has performed the show in his Waldorf living room to a capacity crowd of 50 over 250,000 times during the course of the last ten years, which makes a grand total of...um...well, a lot of people. My math teacher father would be so proud of me. Basically, when Steve said that the program should be placed on each fancy chair in a very specific manner, I trusted that he had a very good reason for saying so. My duties were simple—I was to wear a black cocktail dress and heels; check in the audience members, who had each paid $75 to $100 a pop; answer questions; place some props in the correct places; and give a welcome speech. As a performer, I am not shy about speaking in front of a crowd, but for some reason, I found this speech a bit tricky to deliver. Steve asked me to practice for the empty room, which I self-consciously did, and he gave me line readings for the jokes. For non-theater folk, this means that he spoke the sentence with the exact inflection he wanted me to use. This behavior tends to be an insult in the theater world, but again, since it was his show and I fully trusted that he knew what he was doing, I didn't mind the suggestion, but I somehow couldn't land the jokes correctly. The accountant in me was not bothered by this failure, since I would be paid regardless of my stand-up skills, but the performer in me was frustrated that I couldn't do what seemed to come so easily to Steve. In the end, I decided that the jokes suited his turn-of-the-century demeanor and cadence, but they didn't go hand-in-hand with my modern-day speaking pattern. Which contains a slight Rochester, or Raaaach'ster, flat "a," of course. Steve has performed for Stephen Sondheim, Martha Stewart, and The Queen of Morocco. Siegfried (minus Roy) even showed up to the last show of the evening, and I was pretty sure he was flirting with me...until I googled him and found out that he and Roy used to be a couple. Steve's act, which is a combination of slight-of-hand, mind reading, and jokes, went over like gangbusters, and the crowds, which dutifully followed the jacket and tie dress code, couldn't get enough. I was quite impressed with the whole experience, including myself for being a part of it. Is Homesickness a Genetic Condition? I'm part of the third generation of homesick women in my family. My grandmother left Italy at 18 to follow my grandfather to America. He had come back to his village to find a wife, and she agreed, thinking that America wasn't much further than Rome and she would return home every year or so. Much to her surprise, the next time she went to Italy, she had four children in tow and another on the way. While she was teaching me to make sauce and eggplant Parmesan this week, I asked where she went on her honeymoon. It turns out that she and my grandfather cut the honeymoon short because she was so upset by their impending departure from home. She said, "I don't know where we went. I didn't see anything because I was crying all the time." My mother only moved about two hours away from home, but to someone who lived in a house full of people and commuted to college, the distance was huge. Both of my parents (who grew up a mile apart from each other) are crushed that they can't be at every Sunday dinner, birthday party, and school play. They packed us in the car for every holiday to make the two-hour trek, and for many weekends as well. I'm not sure how they got the three of us in the station wagon along with all the presents from Santa without us figuring out Santa's identity, but they did. They constantly toy with the idea of moving back--they've actually been thinking about it since I was eight--but they still think doing so would "uproot" their three adult children who don't live at home. Then there's me. I went away to college, I went away to grad school, and I went away for a job. But it kills me each time. And even now, when I leave home to get back on the plane, train, or bus that will take me far away from the people I love, my parents say, "Are you sure you have to go back? You don't have to leave, you know. Wouldn't you rather stay here with us?" And each time I leave, for the first five minutes on the plane, train, or bus, I can't see anything because I'm crying the whole time. As a New Yorker who experienced 9/11 firsthand, you'd think I'd want to write down every detail to share with you. But I don't. The thing is: I'd prefer to forget. I want to forget the horrific day I watched through the picture windows of my Soho office as a plane flew into a tall building, causing an explosion I had only seen in movies. I want to forget that trains stopped running, virtually trapping me in Manhattan. I want to forget the droves of business people marching uptown, covered in dust from the knee down. I want to forget the hours I couldn't contact my parents to let them know I was okay. I want to forget the way I jumped every time I heard a plane fly overhead. And I want to forget the feeling that every choice I made throughout the day was a life or death decision. Writing those words makes me feel incredibly selfish because in the grand scheme of things, I got off easy. I don't know anyone who died that day. But even so, the day stays with me. If I could, I'd skip right over it—from 9/10 to 9/12—the same way hotels sometimes skip the 13th floor. I don't mean to negate the tragedy or the heroism of it all, but I'm tired of remembering how helpless and vulnerable we can be. I want to go back to the days before we had to take our shoes off at the airport. It's not that I don't want to remember--I'd just prefer to forget. Life upon the wicked stage ain't ever what a girl supposes. The casts, the curtain calls, the exquisitely tailored costumes built just for you--everything about singing and dancing for a living has surpassed my expectations. And the applause ain't bad either. One day your alarm wakes you up at 5:30 am. You glance over at your backpack that you, a 30-something adult, have packed with tap shoes, character shoes, ballet flats, dance clothes, hot rollers, hairspray, Russian Red MAC lipstick, non-dancing heels, a wrinkle-free audition dress, and a three-ring binder of sheet music. You peek out the window and see the snow starting to stick. You know that to secure an audition appointment, you'll have to arrive at the audition by 6:30 am, but you may not be let into the building until 8. Once inside the building, you'll have to sit on the floor (if you're lucky) in a room packed with hundreds of women with similarly bulging backpacks, all fighting to use three electrical outlets and talking in overly bright voices about nothing. If you're unlucky, you may find yourself standing up, shoulder-to-shoulder, in a hallway with a frazzled building manager charging you with the impossible task of not being a fire hazard. It's now 5:40 am. Is it worth going to all that trouble to compete with two hundred girls for two spots in a show that will give you five weeks of work at $600 per week? I used to think it was worth the trouble. Though I would complain about auditions, I would enjoy the challenge and the excitement and the camaraderie of my true friends, girls that I went to happy hour with after auditions, and my "audition friends," girls whose names and resumes I knew but that I didn't see outside the audition holding room. Auditioning is exhausting--but what's my other option? Working nine-to-five at a job where no one applauds for you? Where's the fun in that? I know I need to move on. But it's not easy. 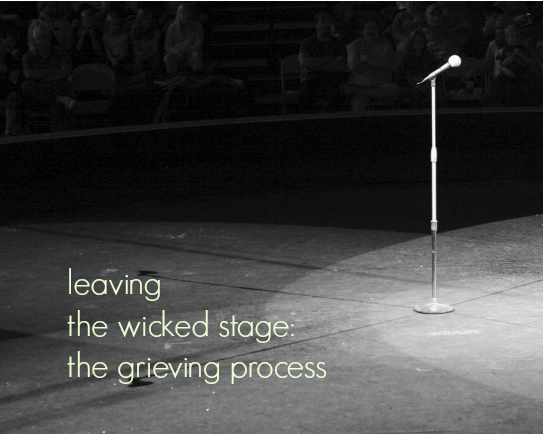 Someone recently described leaving the theater life as a grieving process. And thinking about shelving that part of my life really does feel like a loss. Living your dream is intoxicating. It's hard to walk away, to move on. But more often than not, I find myself wanting to put down that backpack. Can stability really ever win over excitement? It's hard to say. Will I ever really leave theater behind? That's hard to say, too. But I do know this: the thought of leaving my tap shoes, character shoes, ballet flats, dance clothes, hot rollers, hairspray, Russian Red MAC lipstick, non-dancing heels, wrinkle-free audition dress, and three-ring binder of sheet music is getting more appealing by the day. For now, I'm still watching the snow fall and considering my options.